This report describes models for thermal comfort and energy consumption in atria. The models include infiltration and natural ventilation, stratification, air flow patterns, surface film coefficients, and solar radiation. These are models which have not been included in many of the commonly used building energy simulation tools, and their improvement constitutes the main result of this research. This report documents a comparative testing and diagnostic procedure for thermal models related to the architectural fabric of the building. The report is divided into three parts: Part I is a users manual on how to apply the BESTEST procedure, Part II describes the development, field testing, and production of data for the procedure, Part III presents the output of the reference programs in tables and graphs. Volume 1: Final Report is the first of this 3 volume set. These activities resulted in the production of a set of Building Energy Simulation Tests (BESTESTs), based on inter-model comparisons. These tests, based on domestic scale buildings, are structured such that reasons for poor predications from a program can be diagnosed. Volume 2: Empirical Validation Package is the second of this 3 volume set. These activities resulted in the production of a set of Building Energy Simulation Tests (BESTESTs), based on inter-model comparisons. These tests, based on domestic scale buildings, are structured such that reasons for poor predications from a program can be diagnosed. Volume 3: Working Reports is the third of this 3 volume set. These activities resulted in the production of a set of Building Energy Simulation Tests (BESTESTs), based on inter-model comparisons. These tests, based on domestic scale buildings, are structured such that reasons for poor predications from a program can be diagnosed. ADELINE is an integrated lighting design tool which provides architects, window designers, consulting engineers, HVAC engineers, lighting engineers, and fixture manufacturers with detailed accurate information about the behavior of daylighting and electric lighting inside a building. It allows the architect to produce innovative and reliable designs by processing a side chain of complexities. It further enables one to calculate lighting energy consumption, the resultant internal heat gains, and the coupled heating and cooling energy consumption. This report concentrates on describing ways of modeling thermochromic glazing systems and how integration of these models into a building energy analysis simulation program can be accomplished. The algorithms introduced in this report will make it possible to determine the interaction between thermochromic switchable glazing systems and a buildings temperature behavior. 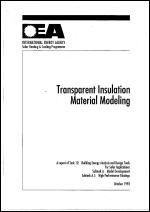 The algorithms presented in this report are intended to compute the interaction of transparent insulation systems and the temperature behavior of the entire building. These algorithms can be incorporated into any building energy analysis simulation tools that compute building energy balances on the basis of hourly weather data sets. The compilation of these algorithms is preceded by an overview of building applications and constructions of TIM systems which give an impression of the overall range of applications.